Zum Auswaschen großer Mengen Schwerekonzentrat, ca. 190 kg pro Stunde. Wird ohne Batterie und Eimer geliefert. A New Professional 25 inch gold wheel that produces unparalleled performance in both speed and fine gold recovery. Recover ultra fine gold better than anything you have ever seen before. This amazing recovery is due to its soft rubber spiral wheel that has an extremely cupped sharp edge riffle. Experience precise and smooth speed control with its long life replaceable geared bearings spiral wheel. Equipped with electrical back panel with speed control, plug in battery, pump terminals and on/off switch. Another unique feature is the metered gold tube that easily screws into the back of the wheel to remove values and a black sand collection funnel to collect a first run of concentrates. The water flow tube has metered water jets for precise flow. Set up by inserting three stainless steel legs and connect a 12 v battery and your ready to witness the most advanced recovery spiral system on the market today. 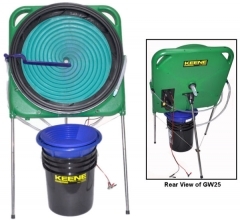 Includes 750 gallon per hour 12 volt pump, wash down hose and nozzle, filter sieve and a solid recovery pan. Capacity up to 400 lbs. per hour. NOTE: 5 gallon bucket & battery not included due to costly shipping fees.